Everyone is talking about GDPR. Apparently, it’s coming our way and we need to know about it or our business will blow up in our face! Maybe you should hire someone to make sure you don’t fall foul of it. Or read countless blogs and articles without being any the wiser. In short, GDPR is General Data Protection Regulation. It’s a regulation coming from Europe that is landing on our doorsteps on 25th May 2018. Your business has to be compliant or it could be subject to fines or further sanctions. The regulations are extremely long and are already being scrutinised by the lawyers. You may have noticed you are getting more and more unwanted emails, yet at the same time, you know that to grow your business you need to get a list of email addresses together and start sending out emails. You also may have given your email address and other credentials to any number of online companies. Just think how many businesses have your email address a password you have given them. The point of GDPR is to make sure that information is only used by your permission and that all information about you is kept safe. It also means that you can only use similar information by the owners’ permission. Why Should We Be Grateful for GDPR? In truth, GDPR goes much further than that, it includes all information held about other people, so this would include personal information held by Health Practitioners and Financial Institutions. It also covers information held about our children who increasingly are living in an online world. GDPR is meant to ensure all information held about us is dealt with responsibly and not shared without our permission. What Is The One Thing You Need To Know About GDPR? Do you want to give your email address to someone and have them share it with others? No, then we shouldn’t do that with email addresses given to us. Yes, there may be some arguing over whether information given is personal or company, but every email address has a person on the other end of it who has to wade through the inbox and look for the emails that are actually relevant to them. Do you like to receive mountains of unsolicited emails from people who have done a “Data Scrape” of thousands of websites? No? Then don’t send unsolicited marketing emails to other people. How would you feel knowing people have got your address and other information about you, “just in case”? Or that they aren’t careful with it, leaving it lying around unprotected? Not a nice feeling is it? We have to be just as careful with the information we have belonging to other people and businesses. I may have oversimplified it and the lawyers will be rubbing their hands as they fight about the tiny details of the GDPR Regulations. Some businesses will want to sail as close to the edge as they can. Businesses have to name a person responsible for looking after Data, but if you are a small businesses owner, that is you anyway. If you are a small business owner with a relatively small list, or just thinking about starting a Newsletter or mailing list, stick to the advice above and you won’t go far wrong. What if you are still concerned. Maybe you are too busy for all this. 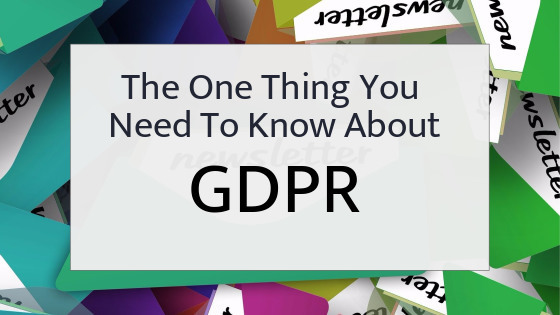 Why not learn more about how I can provide you with a GDPR Compliant Newsletter? Has GDPR Endangered Our Privacy?